Based in Dundalk, Ireland, BoyleSports is one of the largest bookmakers in Ireland. The trusted bookmaker was established in 1989 and has 231 betting shops across Ireland. In addition to its online betting business, the strong brand operates a telephone betting service. The company sponsors horse and greyhound racing events. Our BoyleSports review will reveal what you need to know about the extensive range of sports, tournaments, payment methods, bonus features, etc. offered by the bookmaker. As you will notice, signing up at this sportsbook is quite simple and safe, and this process is usually sweetened by a BoyleSports welcome offer. The bookie offers you a 30 GBP free bet, if you place a qualifying bet of 10 GBP or higher at EVS or greater with your new account. Get a Cash back on all antepost bets in the 2018 Cheltenham Festival if your horse doesn’t run. The bookie Boylesports offers his customers in diffrent frequencies diffrent VIP offers, like Trips to top sport and racing events. The Irish sportsbook provider was founded was John Boyle, thus giving the company its name. BoyleSports started with just one retail shop in 1989. Over the years, the bookmaker took over shops from Celtic Bookmakers as well as William Hill. 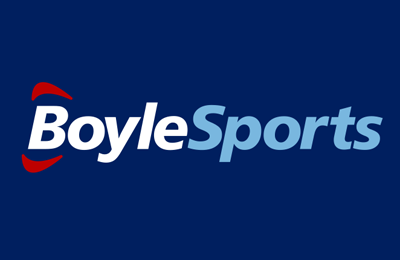 Now BoyleSports has more than 200 brick-and-mortar shops in Ireland. The company is involved in sports betting online and by telephone as well, employing around 1.700 people in all of its branches. In 2011, the sportsbook signed a sponsorship deal with Leopardstown racecourse that would last for three years. Furthermore, from 2008 to 2013 BoyleSports was the official betting partner of the Football Association of Ireland, including the Irish National Team and the League of Ireland. The bookmaker is licensed in both Gibraltar and the UK. Our BoyleSports review found that the current bonus offer for new customers in the UK is quite good, but not that simple. In total, you will receive 30 GBP in free bets (6 x 5) when you sign up with the sportsbook. Deposits made with Moneybookers, Skrill, Neteller or prepaid cards will not qualify for this BoyleSports offer. Is there a bonus code? When you bet 10 GBP, BoyleSports will give you a free bet amounting to 5 GBP, whether you win or lose. This first bet must be placed at odds of 1/2 (1.50) or greater on sportsbook markets. Afterwards, you must place 3 more bets of 10 GBP at odds of 1/2 (1.50) or greater in order to get another 5 GBP free bet. This can be done four (4) times in total, to obtain a maximum of £20 in free bets (not including the original free bet). Please keep in mind that your qualifying bets must be placed within 30 days of registration and that your free bets expire 7 days after they have been credited to your account. There is no bonus code for this BoyleSports sign up offer. Receiving 30 GBP in free bets sounds good to a newcomer, but the bonus conditions might be a little bit difficult to understand. This is why this BoyleSports review has drawn up a brief tutorial to help you obtain the maximum bonus amount. Step 1 – Registration: Go to the BoyleSports homepage and click on the green “Join now” button in the top right corner. The registration form will open up. Fill in the necessary information, such as name, address, username, password, etc. Click on “Register” to continue the process. Step 2 – Making a deposit: Go to “Account”. Select a payment method, enter the currency and deposit a minimum of £10. N.B. Moneybookers, Skrill, Neteller and prepaid cards are not eligible for the BoyleSports bonus offer. Step 3 – Fulfil the bonus conditions: Place a first bet of £10 at odds of 1/2 (1.50) or greater on any sport. You will get a £5 free bet. Then place up to 4 x 3 bets of £10 at the same odds. You will get a £5 free bet for each time. You have 30 days to fulfil the wagering requirements. Step 4 – Use the free bets: The first £5 free bet will be credited within 1 hour of settlement. Each free bet that follows (max. 4 x £5) will also be applied within 1 hour of settlement. You have 7 days to use the free bets. In order to attract new customers and keep existing ones betting at BoyleSports, the bookmaker offers a variety of promotions. During our BoyleSports review, we found the following ones among others: “ACCA Loyalty” for football bets gives you a £5 free accumulator bet when you place 5x £10 football accumulators. This must be done at minimum odds of 1/3 for all of your ACCA selections and you need to opt in to claim this offer. Additional T&Cs apply. Another promotion is “Fair Play Moneyback” for horse racing. BoyleSports will refund your bet on a horse if this one fails to start the race for any reason. The maximum refund amount is £100. Betting at Ireland’s second largest Irish bookmaker is quite an experience. The sportsbook offers a large variety of sports, such as horse racing, greyhound racing, tennis, golf, football, cricket, basketball and rugby. In total, there are more than 30 sports that you can bet on here. Among those, you will find some fringe sports such as snooker, cycling and bowls. In addition, various special bets can be found such as on reality television and award ceremonies. Our BoyleSports review noticed that the live-betting section is quite extensive as well, especially with regards to tennis and football. However, other bookmakers do offer more live betting options. The live-streaming options are also quite limited since they consist of UK and Irish horse racing as well as greyhound racing. If you wish to watch those races, you simply have to place a bet of at least £1 on a selection. When it comes to the odds offered by BoyleSports though, they are very attractive. The Irish bookmaker has an average quota of about 93%. The well-known European leagues offer better odds. In the Premier League or Champions League, you can find odds up to 97%. The key is slightly lower when you bet on less popular sports and events. All in all, although the fluctuations are not too strong, the odds at BoyleSports are stable. Our BoyleSports review could not determine any tendency towards favourites or outsiders. Our BoyleSports review has shown that the Irish bookmaker leaves almost nothing to be desired. The good customer service is definitely worth mentioning, especially the live-chat which replies within seconds. With two European licences, the sportsbook ensures safety and reliability. The bookmaker can also score with the wide selection of sports that are offered, both in breadth and in depth. There is still room for improvement in the live-streaming area though. A larger selection would be much appreciated by punters in general. The betting odds are quite good, especially concerning popular football events. The BoyleSports sign up offer might not be very simple, but the free bets amounting to 25 GBP are certainly worth the effort. BoyleSports is worth a try, whether you are new to betting or an experienced punter. Funding your betting account could not be simpler. BoyleSports has a large selection of banking options that range from credit/debit cards (MasterCard, VISA) to e-wallets (Skrill, Neteller, PayPal) to bank transfer. Even BOKU, a mobile payment method, is an option. According to our BoyleSports review, all deposit options are free of charge. The minimum deposit amount is 5 GBP. The funds are normally available instantly, except in the case of bank transfers, because this can take up to 3 days. Step 1 – Go to the banking section of your account: Go to your “Account” and select “Deposit”. You will be given a variety of payment options. Step 2 – Select the desired payment method: Choose the method that you prefer, enter the currency and the amount you wish to deposit (min. £5). Step 3 – Transact: Fill in any other details required by the payment method you chose and confirm the transaction. Your funds should be available right away, except for bank transfers. At BoyleSports, many withdrawal options are available to you. Please note that like every online bookmaker, you might be required to withdraw your funds via the same way you deposited them. Furthermore, you might be asked to verify your account upon your first withdrawal. The minimum withdrawal amount is £10. Withdrawals are generally processed between 3 and 5 working days for all methods of payment. If you have a question, first you can go to the “Help Centre”. Here you will find numerous articles on different betting topics. However, if you wish to have a quick reply, then this BoyleSports review recommends using the live chat. This service is available 24/7 and the staff is very competent. Just click on the “Contact” tab on the right. You can also send a message to the support staff at care@boylesports.com or just contact them by phone by dialling 0800 22 00 66 (UK), 1800 22 00 66 (Ireland) or +353 42 939 3168 for the rest of the world. Like most bookmakers today, BoyleSports is present on social media. In fact, the sportsbook has around 150.000 followers on Facebook and about 66.000 followers on Twitter (@BoyleSports). The bookmaker uses those channels to advertise the current promotions, publish sports news and keep in touch with its users. Our BoyleSports review also noticed that the online betting provider has a YouTube channel, where sports commentaries are shown. Reliable or scam: How safe is BoyleSports? The Irish bookmaker, which was founded in 1989, is definitely a safe place to bet at. BoyleSports is licensed by the British Overseas Territory of Gibraltar as well as being regulated by the UK Gambling Commission. This means that the online betting provider is subject to strict requirements. In the course of our BoyleSports review, no scams or indications of dubious business behaviour were encountered. Security checks such as identity verification are regularly done, at the latest before a first payout is due. Moreover, payments are made via secure SSL encryption. Can I set deposit limits on my BoyleSports account? Yes, you can and it is quite simple. You can call the Customer Service Team or send a written request to the Head Office. Alternatively, just log into your account, go to the “Responsible Gambling” section in “My Account”. Here you can set your daily, weekly and monthly deposit limit. How long does it take to settle bets? Bet settlement is quite rapid. A slight delay might occur when official confirmation of the end result is required. As a rule, bets are settled within an hour of the event finishing, and even during the event in the case of In-Play bets. Is there an Android BoyleSports App? Yes, there is. According to our BoyleSports review, you can bet on the go with the mobile app 24/7. Just download the BoyleSports betting app directly from the bookmaker, since it is not available from the Google App Store. You will even get a free bet as a welcome bonus. What is the “Opt-in” feature? The Opt-in feature is new for online promotions. When this button appears on the homepage banner, the promotion page or in an e-mail, then you must click on it to take up the particular offer. The system will remember you based on your login, so you never have to opt-in again for the same promotion. Yes, you can, if you are a resident of Ireland or the UK. In fact, PayPal is the safest and simplest way to pay online. Once you’ve signed up with them, you can pay using your debit or credit card, bank account or PayPal balance. Deposits from PayPal are instantly credited to your Boylesports account.